The seven works on this collection represent Dennis Miller's output over a nine-year period, from 1999 to 2008. 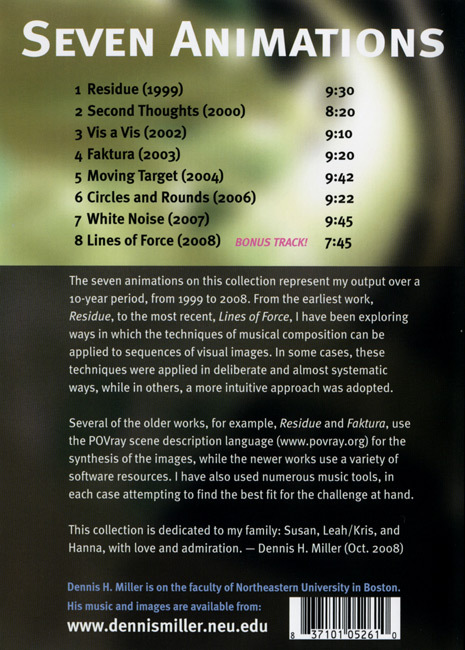 From the earliest work, Residue, to the most recent, Lines of Force, he has been exploring ways in which the techniques of musical composition can be applied to sequences of visual images. In some cases, these techniques were applied in deliberate and almost systematic ways, while in others, a more intuitive approach was adopted. Several of the older works, for example, Residue and Faktura, use the POVray scene description language for the synthesis of the images, while the newer works use a variety of software resources. Dennis has also used numerous music tools, in each case attempting to find the best fit for the challenge at hand.